We’re smart shoppers. We’re always on the lookout for pieces that offer endless styling possibilities. As is whoever’s styling Bella Hadid these days (Elizabeth Sulcer? Farren Fucci?). Just kidding. We all know the supermodel rarely wears the same thing twice. (We’re talking apparel, not accessories.) Nonetheless, both we and Bella/Bella’s team happened upon the same idea — why not hit the streets in swimwear? The new raft of stylish swimsuits certainly cost enough and it’s not like we’re making it to the beach more than a handful of times this summer. Why not get our money’s worth, substitute our bralettes and tube tops for something equally ab-baring and far more sweat-resistant? The “swimtimates” trend, as Vogue puts it, is essentially the love child of the athleisure and lingerie-as-daywear movements. 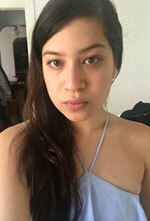 It’s now perfectly normal to go about your business in a sports bra or a bralette (worn over a tee, under a blazer or solo and unashamed); bikini tops are, in essence, bras designed for public viewing. During her recent stint in Paris, Bella left the house in swimwear on no less than two occasions (though both occurred on June 22). Early that day, the supermodel rocked a barely-there bandeau top (the exact material of which is unknown, but it looked a lot like beachwear) with a snakeskin motorcycle jacket, light-wash skinny jeans, denim sandals, tinted oval sunnies and her now-signature gold hoops. That evening, for Heron Preston’s Spring 2018 presentation, the supermodel swapped her bandeau for a similarly sleek triangle bikini top that fastened at the front. This she wore with a cropped, bright orange denim jacket, a matching miniskirt by Preston and black thigh-high boots. At the Spring 2017 shows, several ready-to-wear labels showed their swim fandom, among them Miu Miu, Altuzarra and Les Copains. Miu Miu put on the most seaworthy show, accessorizing its models with bathing caps, beach towels and shell- and starfish-embossed wedges. 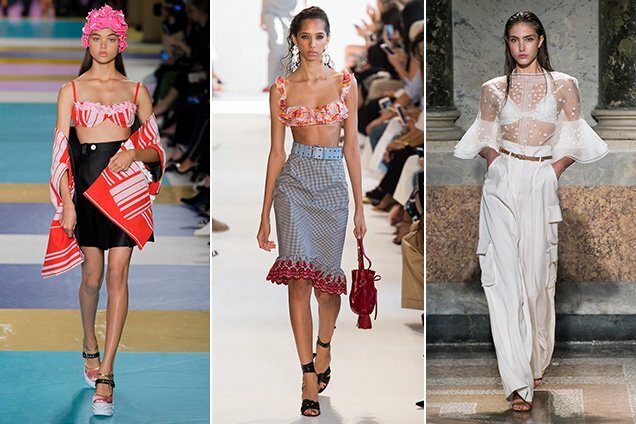 Joseph Altuzarra took an ultra feminine take: ruffled, floral-printed, would-be bikini tops came paired with belted, high-waisted, similarly sweet skirts. Les Copains’ Stefania Bandiera designed clothes with the female adventurer in mind. Crochet bikini tops peered out from beneath sheer, fluted-sleeve blouses tucked into high-rise cargo pants — vacation dressing at its best. When it comes to wearing bikini tops as regular tops, there are three key styling tricks. First, layer over or under other pieces (a tailored jacket, a cropped sweatshirt or tee, a sheer shirt). Second, avoid tops that are excessively “bathing suit-y” — choose ones that can be easily mistaken for regular ol’ crop tops. Third, keep your bottoms high-waisted. …And for all those poor souls who are still bikini-less in mid-July, click through the slideshow below to shop our favorite swim-tops-of-all-trades.